Observation - Black Adder - UK and Ireland. 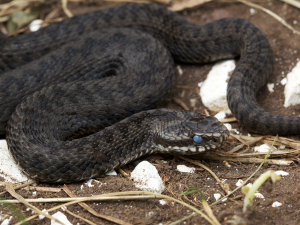 Description: A dark form of the Adder - this is a fairly young one at about 40 cm long. You can see from the cloudy eye it is preparing to shed its skin. Taken with Canon 5DMkII and 100 mm macro lens. A dark form of the Adder - this is a fairly young one at about 40 cm long. You can see from the cloudy eye it is preparing to shed its skin. Taken with Canon 5DMkII and 100 mm macro lens.